See how Allscripts Professional EHR™ is helping Choice Medical Group raise its standards of care to an Accountable Care Organization (ACO) level, with analytics, patient engagement and an open framework. Choice Medical Group is an Independent Physicians Association with 40 independent physicians spread across a 70-mile radius in the high desert. This organization must coordinate care with an additional 120 specialists and deliver quality care to an extremely rural population. 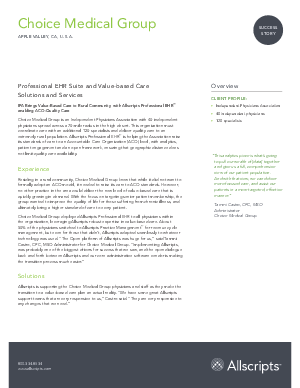 Allscripts Professional EHR™ is helping the Association raise its standards of care to an Accountable Care Organization (ACO) level, with analytics, patient engagement and an open framework, ensuring that geographic distance does not limit quality care availability.